Diabetic Jute Bag is rated 4.8 out of 5 by 4. 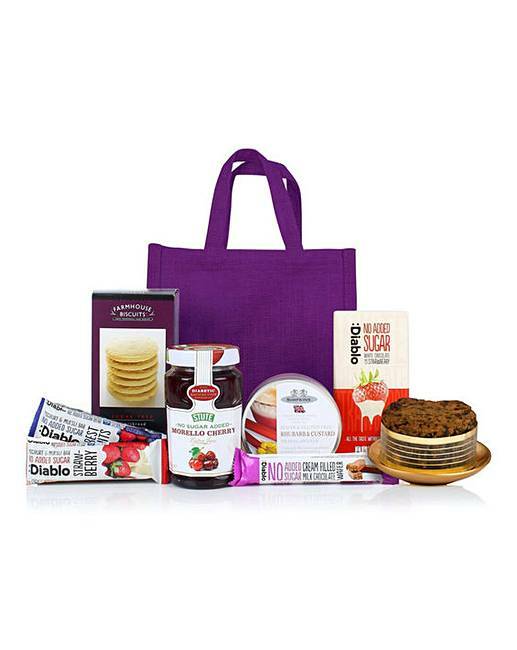 Inside this jute bag is a tasty collection of diabetic treats including a chocolate bar, oat crunch biscuits, cake and morello cherry jam. Contents- Diablo No Added Sugar white chocolate bar with strawberry, 75g. Diablo No Added Sugar yoghurt coated strawberry muesli bar, 30g. Diablo No Added Sugar yoghurt forest fruits muesli bar, 30g. Diablo Sugar Free Cappuccino & Cream sweets, 75g. Farmhouse Biscuits Sugar Free oat crunch biscuits, 150g. Gold Crown 4" No Added Sugar fruit cake. Stute No Added Sugar Morello cherry extra jam, 430g and red jute bag. Rated 5 out of 5 by Choccydog from Great Gift Idea I brought this for my friend who is diabetic for a Christmas present. She was over the moon with it. Everytime she has something from it she rings me to tell me how nice it is. She even raved about the fruit cake and she doesn't normally like it! I will definitely buy it again for her as she has enjoyed it so much. The quality is very good. Rated 4 out of 5 by Gerbil from Ideal Quite good as a present. Not enough selection but what there was was nice.